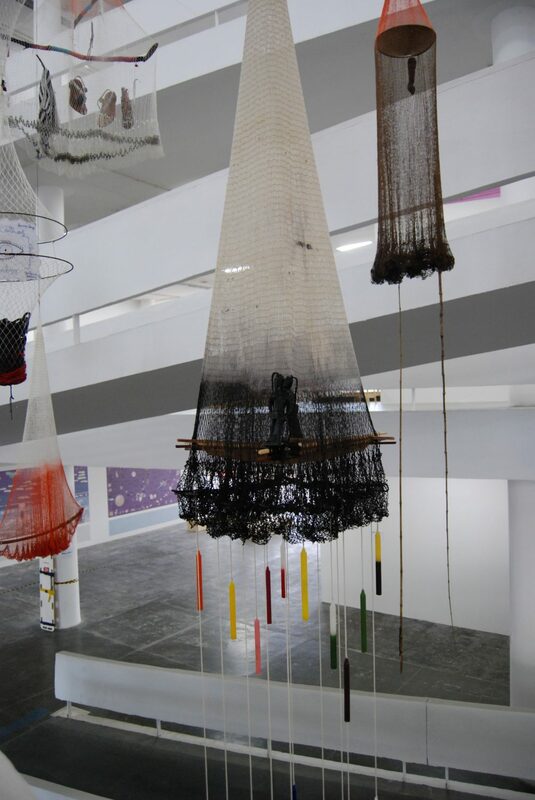 Installation view at 32nd São Paulo Biennial. 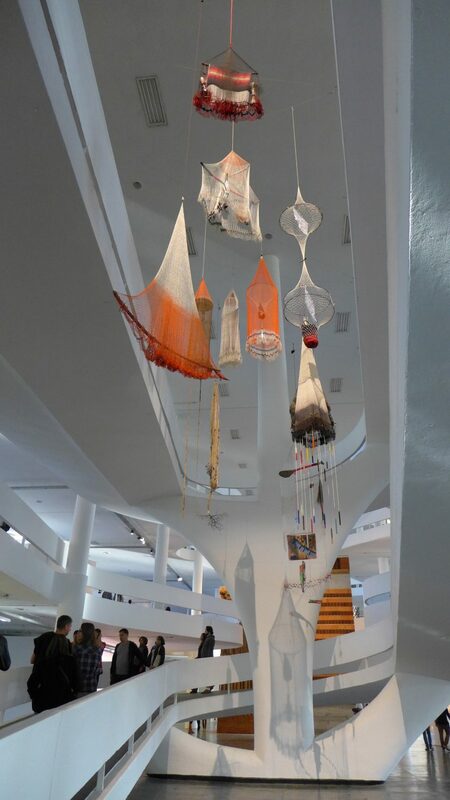 The Cosmotarrayas are a series of hanging sculptures assembled with handmade fishing nets and other objects, collected during my field research in different riverine communities affected by the privatization of waters in Colombia and Brazil. Some of the fishing instruments where given personally to me by fisherfolk who can’t use them any more. 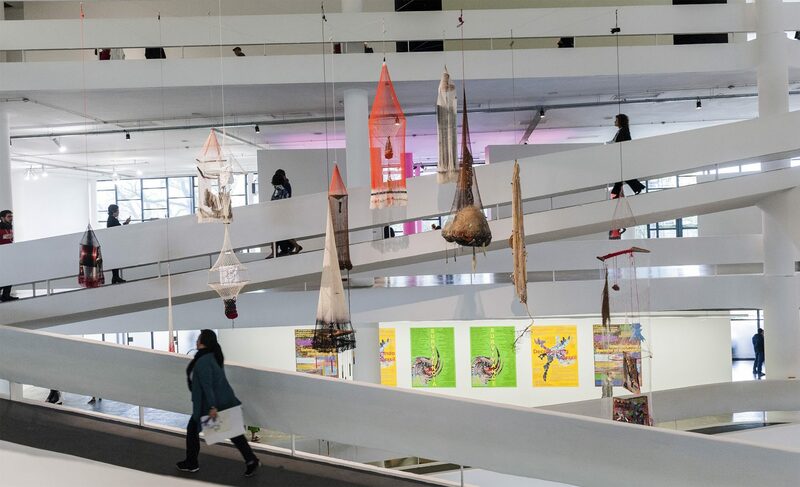 The Cosmotarrayas can be read as a cosmos about the persons I’ve met, and their stories of dispossession and resistance, operating as a connector between my community involvement and my studio practice. Atarraya or tarrafa (its brasilian portugues equivalent) comes from the arab atarrahar, which means to throw. In Colombia it is also called: rayo, espe, red de pesca, manta, charrasco, chile, chilón, atarriyita. 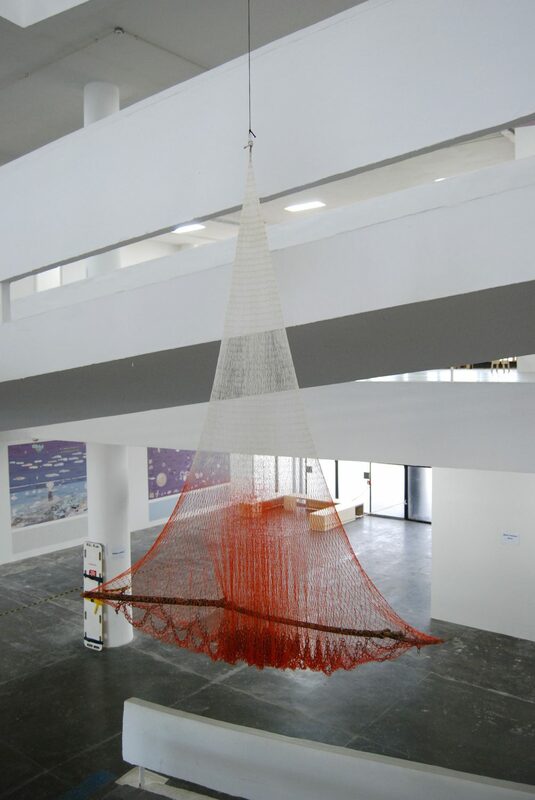 While the wall of a dam is impermeable, unmovable, with a solid structure, built by a corporate subject, and cuts the river in two; the artisanal fishing net is porous, permeable, with a malleable and fluid structure, that allows for the river body to flows thru, it is woven by hand by, one to one. 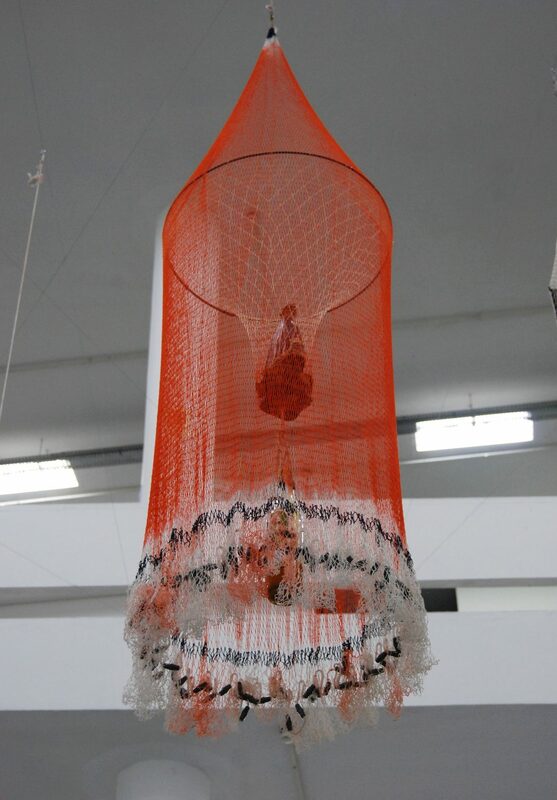 The artisinal fishing net, or atarraya, is a connection between the human and the extra-human. It embodies the wisdom the weaving and knowledge fisherfolk have about their rivers, it stands for food sovereignty and autonomous economies, and can serve as a guide for a more equitable and horizontal social fabric. To throw a fishing net affirms the river as a common good. 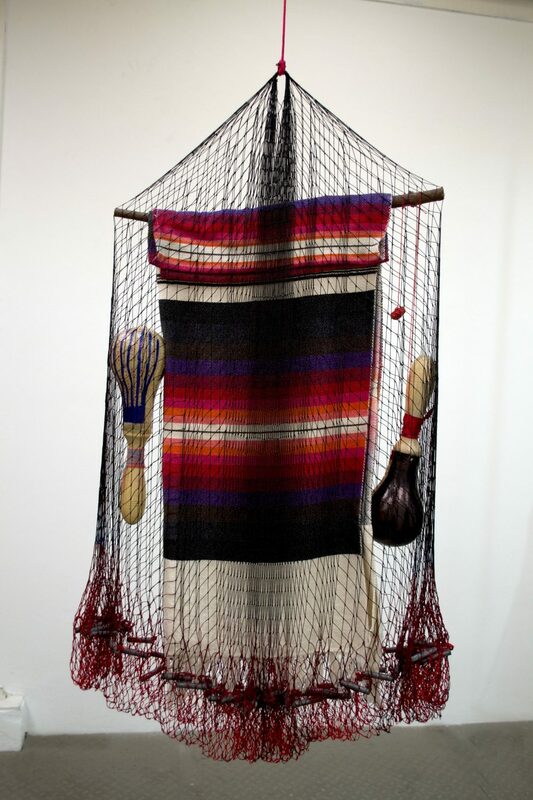 Hand dyed artisanal fishing nets, led weights, wood stick, cotton poncho, leather maracas, dry chile pepper. 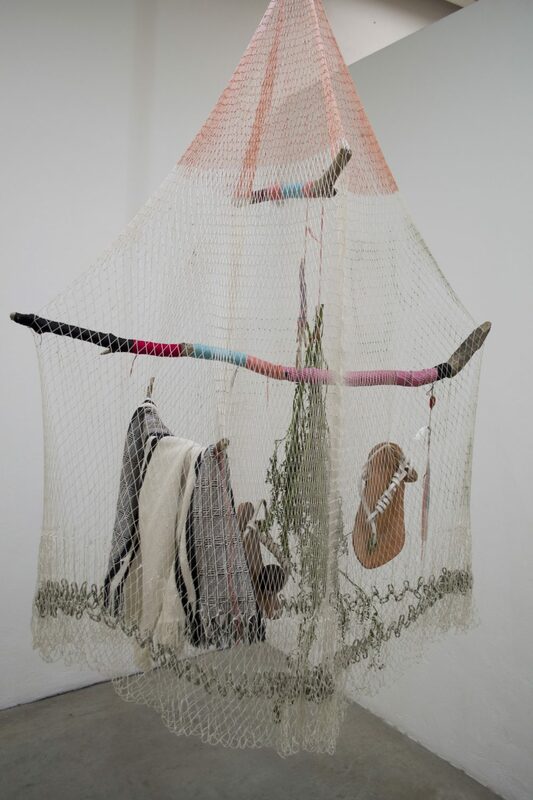 Artisanal fishing net, lead weights, wood stick, hand dyed wool string, dry sage, tambourine, hand-made tambourine stick, leather and rubber artisanal sandals (huaraches), wool poncho. 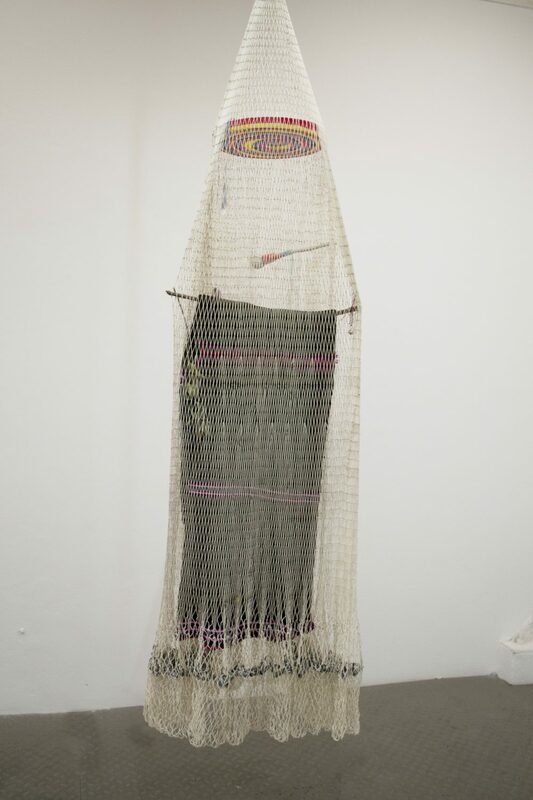 Artisanal fishing net, lead weights, leather sandals (huaraches), 2 wood sticks wrapped with wool and raffia, cotton poncho, ribbon, dry chile pepper, dry sage. Hand dyed artisanal fishing net, lead weights, funnel fishing net with iron ring, ceramic figure, 2 reed cords, 2 shells, dende oil, cachaça glass bottle. Hand dyed artisanal fishing net, lead weights, 20 colored candles, 2 black figure candles, hand dyed cord, brazilian nuts, seeds, artisanal mandioca sieve basket. Hand dyed artisanal fishing net, steel chain wooden stick.